What it the overwhelming trend? Cooling or Warming? In the greatest water crisis in the history of CA, Brown has only declared a Stage 2 emergency of voluntary cutbacks even though the taps have been turned off. WTF? Governor Brown is urging voluntary water conservation to the tune of a 20% reduction. But he stopped short of saying such a reduction should be mandatory — for now, at least. Chuck Bonham, director of the California Department of Fish and Wildlife, urged everyone to come together during the crisis. The Federal government just released their first assessment for water allocations for the coming year in California after the driest year on record since they kept records 118 years ago. The news is historical and breaks a 54 year contractual agreement with state water suppliers..
California officials who manage the State Water Project, the state’s other major water system, have already said they won’t be releasing any water for farmers, marking a first in its 54-year history. Contractors that provide farmers with water and hold historic agreements giving them senior rights will receive 40 percent of their normal supplies. Some contracts date back over a century and guarantee that farmers will receive at least 75 percent of their water. “The snowpack – often called California’s largest reservoir – normally provides about a third of the water used by cities and farms as it melts into streams and reservoirs in spring and early summer. California’s major reservoirs, mostly bereft of both snow and rain this winter as the drought pushes through its third year, are dangerously low. NEW HUGE DAM PROPOSED FOR NORTHERN CALIFORNIA INCLUDING RAISING SHASTA LAKE 8 FEET, DROWING OUT MORE INDIAN TRIBAL LANDS AND PEOPLE.At issue is the proposed “Sites” reservoir just east of Lake County and the Mendocino National Forest, not far from the Central Valley town of Maxwell. The huge lake — five times bigger than Lake Sonoma — would not dam a regional watershed or fishery. Instead, it would hold water diverted from the Sacramento River.The last major reservoir to be built in California was Diamond Valley near Hemet, which can store 800,000 acre-feet of water and is operated by the Metropolitan Water District of Southern California. Sites would hold 1.9 million acre-feet, making it the seventh largest in the state.The bill from Garamendi and La Malfa is one of numerous proposals floated by federal lawmakers to address the drought, both through new storage and other measures. Republicans already have pushed through legislation in the House that would authorize construction of other major reservoir projects. While it’s too early to tell precisely how much the drought will push up household grocery bills, economists say consumers can expect to pay more for food later this year because fewer acres of land are being planted and crop yields are shrinking. Kathy Jackson, CEO of the Second Harvest Food Bank of Santa Clara and San Mateo Counties, which distributes 52 million pounds of food each year to low-income residents from Daly City to Gilroy, says the drought could prove devastating to the people her organization serves. That’s because 27 million pounds of the food her organization hands out annually is fruits and vegetables donated by California farms and growers. Many of the families Second Harvest serves live in “food deserts” with no major retailers nearby, just corner stores. “Fresh produce is the most difficult food for our clients to both find and afford,” she said. Jim Cochran of Swanton Berry Farm in Davenport offers a hint of what may come. He stopped watering his artichokes a month ago and expects the cost of a pint of organic strawberries, which usually sell for $3.50 at Bay Area farmers markets, to go up roughly 20 percent to at least $4.20 a pint. The San Joaquin Valley in California can be stunningly beautiful: On a visit two weeks ago, I saw billions of pink almond blossoms peaking, with the Sierra Nevada towering over all. It can also be a hideous place, the air choked with microparticles of unpleasant origins (dried cow dung, sprayed chemicals, blowing over-fertilized soil), its cities like Fresno and Bakersfield sprawling incoherently and its small towns suffering from poverty, populated by immigrants from places as near as Baja, Mexico, and as far as Punjab, India. This year, much of its land is a dull, dusty brown rather than the bright green that’s “normal” here, even if “normal” is more desire than reality. With water, this is the best agricultural land in the world. Without it, not so much. If you have a good well you can pump groundwater at will; atypically, that’s not managed by the state, so you pay only for drilling and electricity. Until, of course, you draw down the water table (or your neighbor does, by drilling a deeper well). This race to the bottom is not sustainable, and wells are going dry as a result. • Develop enforceable regional per capita water usage targets based on the efficiency and conservation measures adopted…. ‘Some 45,000 Palestinians living in the Shuafat refugee camp and the suburbs of Ras Shehadeh, Ras Khamis, As-Salam and Anata in Jerusalem have had their water cut off for nearly three days. The residents said Israel’s water company Gihon started by gradually reducing the water supply nearly two weeks ago until it stopped entirely. A member of Shuafat’s popular committee; Khaled Al-Khalidi said on Wednesday that 23,000 refugees had no access to water for three days while the residents of Ras Shehadeh; Ras Khamis, As-Salam and Anata have been without water for 20 days. 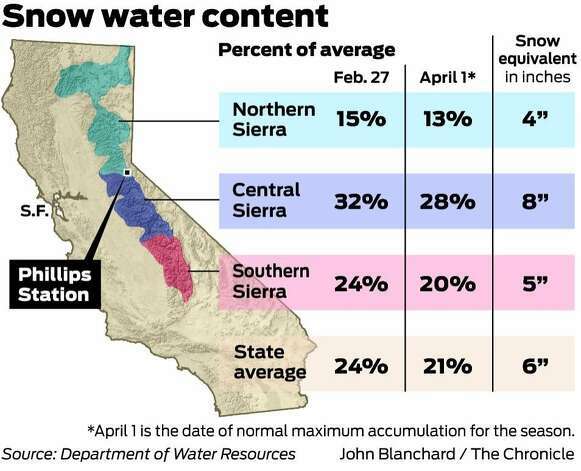 Although there’s more snow than there was a month ago – when the accumulation was just 12 percent of average and surveyors found bare ground in some spots – it’s likely that cities and farms that depend on the Sierra for their water will come up short in the summer. 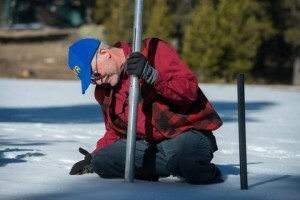 The Department of Water Resources’ snowpack measurement is a benchmark for state and federal officials who determine how much water California’s networks of reservoirs and canals will deliver to communities and farms. At the Phillips Station off Highway 50 near Echo Summit, surveyors measured 8.1 inches of water in the frozen snow Thursday, just a third of what the site averages at this time of year. It was the same story at other weather stations. Speaking at the North Coast Regional Water Quality Control Board’s once-every-other-month meeting in the north Santa Rosa burbs on January 30th, California State Water Resources Board member Steven Moore characterized California’s drought as a natural disaster of epic proportions. “This is our Hurricane Sandy,” he told the North Coast’s five regional board members. In spite of a few solid drenchings in the past week, as well as a relatively wet February across much of California, the drought is indeed leading to some serious dislocations in many areas of the state, especially for farmers. We have San Joaquin Valley almond farmers pulling thousands of acres of trees and chipping them to sell to power plants. Cattle ranchers in Bakersfield and elsewhere in the region are selling their stocks en masse as grasslands dry up and hay prices stratify. Fields across the US’ most prolific agricultural region lie fallow. The idea that the drought is a natural disaster, as opposed to a human-engineered catastrophe (or, better yet, a capitalist-engineered one), papers over the real causes of the state’s water crisis: California’s insanely wasteful and destructive water system. California already leads the nation, by far, both in its number of large dams and reservoirs and in their storage capacity. More than 1,400 state and federal dams and their reservoirs are built to capture 42 million acre feet of water, almost sixty percent of all the state’s water runoff (runoff being water that flows in streams, creeks, and rivers). Private dams capture much of the remaining water. “Water resource management is key and fundamental to what Open Space’s mission is,” said Jay Jasperse, a Sonoma resident and the Water Agency’s chief engineer. A bucolic 9-acre pasture grazed by cows on Sonoma’s northwest edge has become an unlikely battleground of late, pitting local government officials who want use it to manage flood and drought concerns against neighbors who say the county promised to preserve it forever in its natural state. The pasture, protected by what is known as a conservation easement, is the southern point of the 98-acre Montini Preserve, which spans the oak-studded hills above it. The Sonoma County Water Agency is eyeing the pasture for a $4 million detention basin big enough to hold almost 4 million gallons of water. The proposal has a group of area residents up in arms. The project would demonstrate “a blatant disregard for the imperative to preserve and conserve” the property, said Mary Nesbitt, who lives on Montini Way next to the pasture. Lake County on Tuesday joined a growing number of counties, cities and water agencies that have declared drought emergencies. A Lake County groundwater study has indicated that some area wells are producing sufficient water for their users but others are being depleted by the drought, said Lake County Supervisor Tony Farrington. “In some areas, this is the worst drought they’ve seen in the history of the county,” he said. “This urgency ordinance is directed at those that have failed to make any efforts to conserve water and are jeopardizing the entire water system with excessive water use,” according to his report to county supervisors. The 60 to 70 upscale homes along Clear Lake’s north shore served by the Paradise Valley water district have actually increased their water usage since last year, despite earlier requests for water conservation, according to Dellinger’s report. He said the increased usage is attributed to 8 percent of those properties. He declined to speculate how the water was being utilized, but it’s probably not for outdoor irrigation. The subdivision has a separate surface water system for outdoor landscaping purposes, Dellinger noted in his report. The new conservation measures include tiered rates that penalize people who use lots of water. They also include fines for people who continue to use more than their fair share. Lake Oroville in Butte County, the State Water Project’s (SWP) principal reservoir, is at only 39 percent of its 3.5 million acre-foot capacity (57 percent of its historical average for the date). 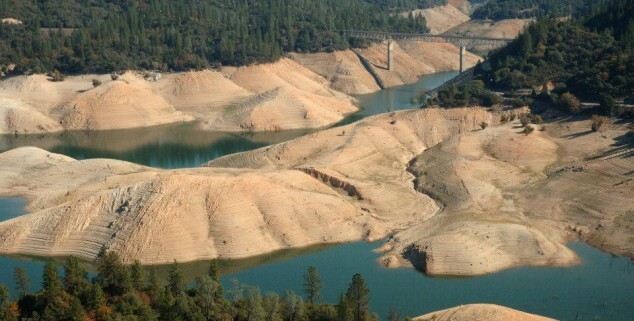 Shasta Lake north of Redding, California’s and the federal Central Valley Project’s (CVP) largest reservoir, is at 38 percent of its 4.5 million acre-foot capacity capacity (52 percent of its historical average). San Luis Reservoir, a critical south-of-Delta reservoir for both the SWP and CVP, is at a mere 33 percent of its 2 million acre-foot capacity (39 percent of average for this time of year). With no end to the drought in sight, DWR on January 31 set its allocation of State Water Project water at zero. The only previous zero percent allocation (water delivery estimate) was for agriculture in the drought year of 1991, but cities that year received 30 percent of requested amounts. This is the first time the allocation has been set at zero across the board. Despite the “zero” allocation, water essential for health and safety will still be delivered. And nearly all people and areas served by the State Water Project also have other sources of water, but most of these also are stressed by three successive dry years. Deliveries will be boosted if storms produce enough rain and snow to boost reservoir storage and the snowpack. Since the start of the year, the county has had less than 8 inches of rainfall as measured in Santa Rosa. Normally, that figure should be around 33 inches. So dry are the conditions statewide that state and federal lawmakers sent letters last week to Gov. Jerry Brown, asking him to declare a drought emergency, and to President Barack Obama, asking for a federal disaster declaration. Water managers are comparing conditions to those in 1976 and 1977, the most severe modern drought in the region, McGuire said. That drought forced widespread mandatory restrictions on water use and led local governments throughout the area to develop aggressive voluntary water conservation programs that remain in place today. There is no immediate threat of water rationing, the agency says, largely because the main reservoir at Lake Sonoma is still about 70 percent full, plenty to provide water for its 600,000 customers in Sonoma and Marin counties through at least one more dry year. But upstream, the smaller and more volatile Lake Mendocino is down to only about 30 percent of its capacity. If the agency maintains its current release rate and the winter turns out to be critically dry, water managers could find themselves with no water to release next summer, spelling major trouble for the cities, farmers and wildlife that rely on the upper reaches of the Russian River — those areas north of where the Lake Sonoma water supply enters the river at Dry Creek. Is Giving treated wastewater to livestock legal (since 1989)??? California’s drought is prompting a statewide push to let ranchers use treated wastewater for slaking the thirst of livestock, sparking health concerns and widespread confusion over whether current regulations already allow the practice. Assemblyman Marc Levine, D-San Rafael, has introduced legislation that he said would allow ranchers to legally use treated wastewater as drinking water for cows, horses, sheep and other farm animals for the first time in California. Levine said the state Department of Public Health, which he said has authority over the practice, has never approved a single such request. SAN FRANCISCO — New figures show U.S. wine exports grew for the third consecutive year in 2012, setting a record of $1.43 billion in revenue, the San Francisco-based Wine Institute said Thursday. Ninety percent of those exports were from California. Volume shipments reached 424.6 million liters or 112.2 million cases. The European Union remained the top market for California wines, accounting for about 34 percent of all sales. The state’s wineries also saw significant growth in Canada and Asia. Sales in China reached $74 million in 2012, up 18 percent from the previous year. South Korea, at $16 million, was up 26 percent. And Vietnam, at $27 million, was up 22 percent. Exports to Mexico also grew for a second consecutive year, to $20 million, an amount that was double the 2009 figure. In Canada, the second largest market for California wines, sales reached $434 million, up 14 percent. California needs rain, and they need it bad. How bad? Just have a look at the GIF above. The first image shows Folsom Lake near Sacramento on July 20, 2011. The second image shows Folsom Lake on January 16, 2014. Notice a difference? That’s what a drought of historic proportions looks like. In fact, 2013 was the driest year California has seen in 119 years, and that’s causing some obvious problems. Gov. Jerry Brown declared a state of emergency last month, and farmers are scrambling to figure out clever ways to save their crops. California’s municipal water system has even announced that it can’t get water to farmers, which is particularly bad news in the state that supplies over half of America’s fruits and vegetables (and almonds). Sonoma County residents will likely be facing mandatory water conservation measures by sometime in April if there is no significant rain before then, officials said Tuesday. “It seems to me that drastic times call for drastic measures,” Supervisor Shirlee Zane said as the supervisors approved a drought emergency declaration that will make the county eligible for state and federal disaster assistance. Healdsburg and Cloverdale have already imposed mandatory conservation because they are dependent on the water coming from Lake Mendocino, which is at just 41 percent of its capacity. The Sonoma County Water Agency has cut releases from the reservoir into the upper Russian River to a trickle in order to preserve whatever it can behind the dam. But there is growing concern about the supply at the much larger Lake Sonoma, which serves more than 600,000 customers in the cities south of Healdsburg, including parts of Marin County. That reservoir, designed to hold a three-year supply of water, is down to just 67 percent of its capacity and is less than a year away from the level at which the water agency would be forced to impose a 30 percent cut on the municipalities that buy the water and distribute it to residential and business customers. In early April, “we’re going to take a hard look at Lake Sonoma … our objective is to extend that water pool into November,” when the rainy season should have started again, Water Agency General Manager Grant Davis told the supervisors. 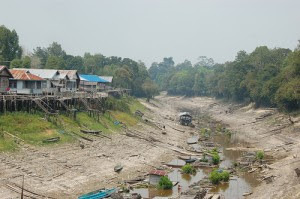 Until the so-far lackluster rainy season wraps up, however, the agency won’t know how much water it will have in the reservoir to meet the dry summer months, and therefore it isn’t clear yet how much the agency might need to do to hold off the steep mandatory cuts as long as possible. A key advisory panel, which includes members from all the water systems that buy from the Water Agency, will look at the reservoir levels at a meeting April 7 and may recommend less draconian mandatory measures to stretch the supply, Davis said. With drought jeopardizing California agriculture, farmers across the state urge Governor Brown to place a moratorium on water-intensive fracking. California farmers, grappling with a record drought that’s parching their fields and livelihoods, call on Governor Jerry Brown to place a moratorium on the water-intensive extreme oil and gas extraction process known as hydraulic fracturing, or fracking. Yesterday afternoon, Shafter almond farmer Tom Frantz, California State Grange President Bob McFarland and Monterey County vintner Paula Getzelman of Tre Gatti Vineyards delivered a petition to Governor Brown’s office signed by 145 California farmers calling for a moratorium on fracking. This past Monday, elected officials and public services staff people from throughout inland Mendocino County met with at least five of the State of California’s highest ranking regulatory officials who deal with water issues. It was heralded as a “listening session” regarding a topic foremost on everyone’s minds in Mendo-land: the drought. The ‘listening session,’ which took place at the Ukiah Valley Conference Center on School St., actually involved ‘listening’ only to a carefully-selected and well-placed group of people, by a carefully-selected and well-placed group of people, for a carefully-selected and well-placed group of people (in the grand spirit of American democracy). The meeting was not publicly advertised. Those not on the 100 person-or-so invite list were prohibited from attending. Apparently, the “listening session” is part of a “listening tour” whereby these same high-ranking officials will blow through numerous California towns, receive oft-contrived statements from local officials about the water problems local residents face and how they are addressing them. If Monday’s proceedings in Ukiah are an indication, the officials will also pause long enough at each stop to issue a handful of generic statements designed to garner platitudes from the corporate press about how much they care about us and admire our resilience in the face of adversity. Ukiah Valley residents, businesses and farmers will be required to cut their dependence on Lake Mendocino water by half beginning next month. The Russian River Flood Control and Water Conservation Improvement District board of directors Monday night unanimously adopted the 50 percent mandatory cutbacks in an effort to maintain as much water as they can in drought-plagued Lake Mendocino. As of Monday afternoon, there was an estimated 28,512 acre feet of water in the shrinking lake, about 41.7 percent of capacity. “I don’t see any other way to do it,” said district board member Lee Howard. No one at the meeting voiced opposition to the measure. The district holds Mendocino County’s right to 8,000 acre feet of water in Lake Mendocino. It sells that water to seven municipal water districts and about 40 farmers. It’s up to the individual water districts to implement water saving measures. The district also voted Monday night to entirely cut off Redwood Valley, which is only allowed to purchase surplus water because it is not within the Russian River district’s boundaries. There is no surplus water to sell, the board agreed. Redwood Valley is expected to be able to purchase water from Sonoma County, which owns a majority of the rights to Lake Mendocino water. , a surefire recipe for great suffering. Five hundred scientists recently told UN Secretary General Ban Ki-moon that our collective abuse of water has caused the planet to enter “a new geologic age” and that the majority of the planet’s population lives within 31 miles of an endangered water source.Yet in election after election the world over, no one’s paying attention to this urgent issue. That’s why I’m calling for a new water ethic that places water and its protection at the heart of all policy and practice. This may strike you as far-fetched, but we must do it now. The future of the planet and the human race both depend on it. And taking our water crisis seriously will change everything. factoid: When Obama started his administration there 3% of the energy used was by solar. Today, it is still 3%. Never mind the restrictions on watering your lawn. The drought is drying up California’s supply of hydroelectricity, prompting SMUD and other utilities around the state to scramble. With summer’s peak electricity demand season looming, officials who oversee California’s power supply say they don’t expect blackouts but are getting nervous about the meager snowpack. Few states rely on hydro as much as California, where water accounts for about 15 percent of the total power supply in a normal year. There is no doubt that California is very dependent on hydroelectric energy to supplement its supply. According to the California Energy Commission (CEC), on average, hydroelectric power generation constitutes between 10 and 27 percent of California’s annual energy supply, depending on what type of water year the region is experiencing. California has 386 hydropower facilities capable of producing about 14,100 megawatts (MW) of electricity – the second largest source of power supply for the state after oil/gas thermal generating units. Comparatively, the Pacific Northwest’s 314 hydro plants produce close to 32,000 MW of electricity – a source for about 10 percent of California’s overall electricity supply. To top it off, the power crunch has come at an inopportune time in the state’s water cycle. California’s two behemoth water deliverers — the State Water Project and the federal Central Valley Project, perhaps the best known water purveyors in the world – are poised to join together to move water quickly around the state in the face of an unprecedented drought. Gov. Brown’s decision to ask Californians to voluntarily reduce their water consumption by 20 percent received support, especially among those with long memories: In the historic drought of 1977, California had 22 million people. This year, it has at least 38 million. But the temporary consolidation of the two enormous water networks — 80 percent of Californians get at least some of their drinking water from the SWP and the CVP serves much of the farm belt — raised concerns and prompted discussions among water districts, environmentalists, farmers and lawmakers. The issue in the north is uncertainty about how the water would be distributed, whether environmental safeguards will be suspended and whether there would be a shift of priorities to move more water south. In the south it is equally basic: How much water will be available?